Now for something totally unconventional, but delicious all the same. These sushi cream tea scones will baffle the eyes and excite the tastebuds... guaranteed to both impress and confuse! 1Make up sushi rice as per the instructions on pack. Leave to one side for 30 mins and don’t remove lid. Once cooled, add soft brown sugar to rice and mix thoroughly. 2Cover a large baking tray with baking parchment. Lightly grease a 4cm round cutter. Place the cutter on the baking tray, press approx 1 tbsp cooked sushi rice inside the ring and level it. Gently push the flattened rice down and release the ring. Repeat this until all the rice has been used. Chill. 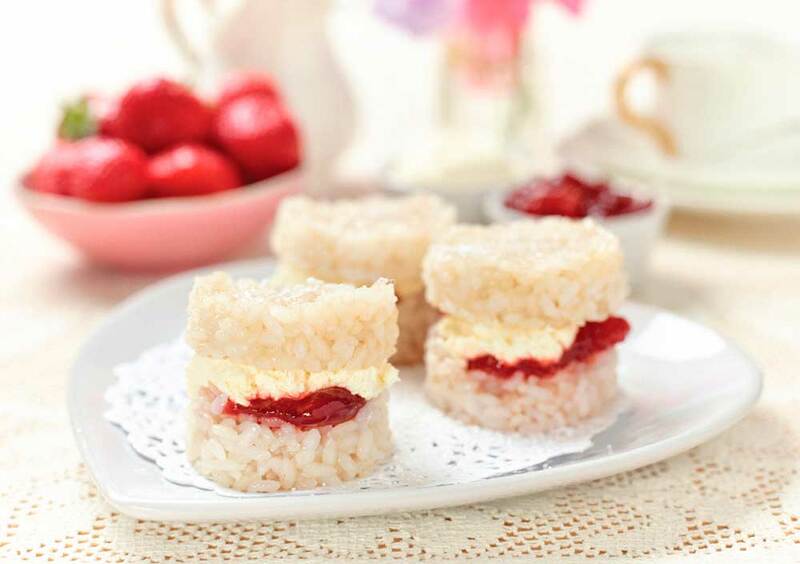 3Spread one rice scone with a layer of jam and cream and top with a second rice scone. Repeat. Gently sieve icing sugar over tops of scones. 4Serve with fresh strawberries and a nice cup of tea.